To take over, duly organise, fully enrich and properly preserve ‘Shri Raghubir Library’, Sitamau, as a unit of the Samsthan. To establish and develop ‘Shri Keshav Das Abhilekhagar’ as a unit of the Samsthan, and to duly preserve the records, etc. that be collected therein. To establish and devlop ‘Shri Raj Sinh Sangrahalaya’ as a unit of the Samsthan, and to duly preserve the object and exhibits, etc. that be collected therein. To establish and duly organise a research centre for carrying out its programmes of historical researches and studies, and other particular research projects undertaken by the Samsthan for due implementation. To establish, organise and duly develop a unit of its own for preparing micro-films or any reproductions by some other processes for purpose of historical researches and studies. To provide facilities and to extend necessary cooperation to researchers visiting the Samsthan for historical researches and studies there, and also give them any helpful guidance, if asked for. To receive any financial or other assistance in cash or kind or the like for the fulfillment of the objects of the Samsthan. To institute scholarships or the like for Carrying out historicak researches and studies under its auspices. To publish caralogues, pamphlets and the like regarding the collection in the various unit of the Samsthan or the activities there of, and to take suitable steps for or to provided necessary assistance in the publication of the results of the researches and studies carried out at the Samsthan. To fully cooperate and/or duly assist in any undertaking by other allied institutions for fulfilling the objects of the Samsthan. To further the advancement of knowledge and learning by means of historical researches and studies at the Samsthan. 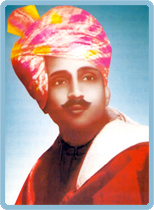 Maharajkumar Dr. Raghubir Sinh was born on 23rd February, 1908 at Laduna Palace of Sitamau in Mandsaur district of Madhya Pradesh. He was the eldest son of Raja Sir Ram Singh, K.C.I.E., the ruler of the former Sitamau State of Central India. He received his primary education at home and Middle School education at then known as Shri Ram High School, Sitamau. He joined the Daly College, Indore in July 1920, but had to leave it owing to illness after a few months. He passed the Matriculation Examination of Bombay University from the Barod High School in 1924 and the Intermediate Examination in 1926, both as a private candidate. Then he taught in shree Ram High School, Sitamau for two years.He passed the B.A. Examination as a teacher candidate in 1928. Thereafter he joined the Holkar College at Indore and took his LL.B. Degree of the Agra University in 1930. He again joined the staff of Shree Ram High School, Sitamau as an honorary teacher and worked there for another three years. He passed the M.A. Examination in History of the Agra University in 1933 as a teacher candidate. Then he undertook the D.Litt. research work on the subject “Malwa in Transition 1698-1766”, under the guidance of the great historian Dr. Sir Jadunath Sarkar and received the D. Litt degree from the Agra Univerdity in 1936. He was the first D.Litt. of that University. In his school days he used to bring out a hand written literary magazine “Kiran” in Hindi and English. It was the budding of his natural talent. His writings in that magazine show that he was developing as a serious writer of essays and Prose-poems, having his own style of writing expressing suitable emotional nuances evoked by social and national issues. It also shows that, inspite of his feudal and princely environment, he had already imbibed liberal, nationalist and democratic ideas, thus laying foundation of his future growth and build-up. His advanced liberal and democratic views led him to undertake reformist actions in his state. His father had taken a keen interest in his education and academic development, had great faith in him and never objected to his progressive views. In his young age he dreamt of a new progressive Sitamau State leading other princely states of India in constitutional, social and cultural development. Soon after passing his LL.B. Examinations in 1930, he was appointed as the High Court Judge of the Sitamau State in 1932, on which post he worked upto August 1940. Along with the judicial work, he was also assigned the responsibility of many other departments of State government, e.g., Revenue, education, police, health and local self-government in July, 1934 and continued to hold the charge of these departments till December, 1938. In order to give a concrete shape to his liberal and democratic ideas, Dr. Raghubir Sinh got drafted a new constitution of the state, which was inaugurated in december 1938. The constitution marked a fundamental change in the governance of the state by associating the people with the state administration, the constitution provided for the establishment of a state legislature (Rajya Parishad) having a majority of elected members. This constitution continued to be effective till the integration of the state in June 1948. The constitution also provided for the state Executive (Shasan Samiti). He worked as the president of the Shasan Samiti from December 1939 to August 1941 and again from July 1945 to June 1948. He also presided over the State Legislative from May 1939 to August 1941 and again from July 1945 to June 1948. During the period of his administration, he made far-reaching reforms in Primary Education, health development and rural development activities of the state. As soon as the Second world war began in 1939, the British Government sought the services of the Princely States of India in several ways, particularly by providing troops, horses and ammunition. The British Government emphasised the need of associating the youth of the royal families and those of jagirdars and zamindars. Raja Ram Singh of Sitamau, thereupon, agreed to send his eldest son, the then administering authority of his state to join the British Army. Dr. Raghubir Sinh joined the O.T.C. at Indore and received full military training for Indian Observer Corps from 1st Oct. 1940 to 28 Feb. 1941. He was appointed as a captain Indian Observer Corps at Rawalpindi on 1st Aug. 1941. Thereafter he received permanent posting of emergency commissioned officer at Queta on the north-west frontier on 12th Sept. 1941. Between 24th August 1942 and 10th September 1942 he was at Peshawar for ‘Officer’s Training’. After the completion of training, he was posted at the Peshawar Cantonment and was sent to ‘Naushera’ where military manoeuvres were being held. In October he was sent to Madras Presidency to observe its sensitive areas, particularly Soinoor and Calicut. He remained there from 18th Octoner 1942 to 10th February 1943. Thereafter he was sent to juhu (Bombay) for a three week special training. Soon after this training he was promoted as a Major, then he was again sent to Madras Presidency. He was first posted at Pallavaram and then afterwards at Waltair where he remained till the end of his military career. He resigned his commission and retired from the army in April 1945. Dr. Raghubir sinh had been a keen student of politics and constitutional law from his early days. He was closely associated with various activities of the Chamber of Princes ever since 1930 and continued his participation upto its very end. He studied very carefully the problems of Indian States with particular reference to their relationship with the constitutional development of India as a whole including the Indian State as well. He wrote a book on this subject: “ Indian States and the New Regime”, published in 1938, which was used as a text book on the subject in many Indian universities for several years. He could foresee the coming political changes in India and the imminent withering away of the old political order. Hence he took keen interest in and worked for the political unification of the States of Malwa region along with others in the adjoining areas during the years 1945-47. He was one of the members of the Central India Region committee appointed in 1946 in order to unite the small states of Malwa into a collective union. Thus he actively participated in the process of bringing about the formation of the Gwalior-Indore-Malwa (Madhya Bharat) Sangh in 1948. Dr. Raghubir Sinh was a gifted writer. As has been earlier, he brought out a hand-written magazine in his school days. He began contributing light essays, critical reviews, short stories and historical narrations from 1927 onwards, which were published in leading Hindi magazines. His initial writings were published in Bal-Sakha and Kshatriya. Later on his thought provoking articles, reviews and stories were published in Saraswati, Sudha, Chand and Madhuri. As we have seen he worked as a teacher, an administrator a judge, an army officer a constitutional expertn a negotiator in political affairs and a public worker of repute. However, he was basically an academician, yearning for knowledge, searching for truth and presenting new ideas and plans before the people. His academic performance is visible in all his activities he under took. He was a man of emotions and he emerged mainly and wholly as a writer. His natural talents in writing literary pieces and historical articles. He founded best exposition of his discipleship of the great historian. Dr. Sir Jadunath Sarkar, his association with other eminent historians like G.S. Sirdesai, Prof. Mohd. Habib, K.R. Qanungo. G.H. Ozha, Tarachand, Jaichandra Vidyalankar, P. Saran, H.R. Gupta, Prof. Ganda Singh, Ishwari Prasad, A.L. Srivastava and prof. Satish Chandra etc., and his constant correspondence with great Hindi writers like Jaishankar Prasad, Suryakant Tripathi Nirala, Sumitranandan Pant, Hazari Prasad Dwivedi, acharya Ramchandra Shukla, Mahadevi Verma etc. had a greatly moulded his ideas and writings. His one articlc about French Revolution Published in the of Chand magazine published in November 1928, reflected his nationalist and revolutionary outlook. The noted Hindi Novelist Acharya Chatursen Shastri, who was the editor of that special issue, wrote about Maharajkumar Dr. Raghubir Sinh That issue of Chand was proscribed by the Government. Whereas several prominent writers got their articles published by pseudonym. However young prince of Sitamau State showed great courage to publish his article in his own name. The publication of Maharajkumar’s article greatly disturbed the British Government authorities and political officers and they made enquiries about the young Prince from the State Government. Thereafter, the British Government remained very suspicious about his views and attitudes. Dr. Raghubir Sinh always aspired to meet and correspond with the patriotic and revolutionary political leaders of India. The wellknown revolutionary leader, Thakur Kesari Singh Barhat of Shahpura was in correspondence with him. The Thakur highly appreciated the new constitution of Sitamau State in one of his letters. Maharajkumar attended in 1935 the Indore session of Hindi Sahitya Sammelan and came in touch with Mahatma Gandhi. He was in continuous correspondence with Jaichandra Vidyalankar, the known revolutionary and noted historian of India since 1932. He was closely associated with Jaichandraji in the formation and working of Bharatiya Itihas Parishad, founded in December, 1937 at Varanasi. During these years he also came in close touch with Dr. Rajendra Prasad and Kanhaiyalal Maniklal Munshi, at Bharatiya Vidyabhavan Bombay. His first book was published in 1932. It was “Purva Madhya-Kalin Bharat”, which at once got great appreciation in academic and literary circles and was prescribed as a text-book for Intermediate and B.A. Classes. It was followed by another literary book “Bikhare Phool”, published in 1933. Malwa in Transition was published in 1938 and its revised Hindi edition “Malwa men Yugantar” was published next year. His another work of political and historical value. “Indian States and the New Regime” was also published in 1938. These books were highly acclaimed as a great contribution to historical learning and established him as a leading researcher and historian. “Sapta Deep” another book of literary essays in Hindi was also published in the same year. Thus by 1938, Dr. Raghubir Sinh had already emerged as rising star on Indian literary and historical horizon. He was well versed in writing prose-poems and his book, which brought him great reputation and name, was “Shesh-Smritiyan” published in 1939. His prose-poetic writings included in this book were unique for expressions of deep emotions and poetic beauty that touched the heart of every reader. The great Hindi litterateur of the period Pandit Ram Chandra Shukla himself contributed a detailed critical introduction to this book. The book was prescribed as a prose-text for the M.A. Examination in many universities. It was translated in Gujarati under the title “Shesh Sambharana”, by Ramnik Meghani. He was associated with Indian Historical Records Commission as a corresponding member by the Government of India for the period 1937 to 1942. He read many important papers at its different sessions. After independence the Government of India nominated him again as a corresponding member of the commission (1952-72) Since 1972 he had been a permanent government nominee on it. He was entrusted with the great task of editing Poona Residency Correspondence Series (Vol. IX, X and Extra Volume) during this period, which were published in 1940, 1943 and 1951. Dr. Raghubir Sinh was fond of collecting books concerning Hindi and English literature and history. By 1936, he had a large collection of books in his palace at Sitamau. Dr. Sir Jadunath Sarkar inspired him to established a research library of history and literature. Thus “Raghubir Library” came into existence in 1936. He arranged the books in a seperate building. The library gradually devloped as a very big and valuable collection of rare printed books, photoprints and transcripts of micro-film copies of unique and historical manu- scripts in Persian Rajasthani, Sanskrit, Hindi and Marathi languages, particularly relating to Indian history from 13th century A.D. to early 19th century, Sir Jadunath Sarkar described it as an important and most valuable collection not only in Malwa and Rajasthan but in whole of India. Lately several original collections of old manuscripts and documents have been received from individuals and former Jagirdars. Since 1946 onwards researchers working for Ph.D. or D.Litt. have been coming from various universities and other institutions to utilize the books, manuscripts and records of the library and receive guidance from Dr. Raghubir Sinh for their work. After the merger of Sitamau State in the Madhya Pradesh Union in 1948, Dr. Raghubir Sinh’s duties as an administrator came to an end. However, considering his efforts towards the merger of the states in the Indian Union and formation of the Madhya Pradesh union his experience in the legal, constitutional and administrative functions, his reputation as a litterateur and historian and his popularity in the people of Madhya Pradesh, Prime Minister Pandit Jawaharlal Nehuru got him nominated as the member of the Rajya Sabha on 13th May, 1952 which he remained up to 1962. Thus a new responsibility was developed on him. He used all his knowledge and experience to fulfil this responsibility. He took great interest particularly in Education. Defence, Communications and cultural affairs. As an eminent historian Dr. Raghubir Sinh showed keen interest in the writing of the hisotry of freedom struggle in India and rewriting of Indian History factually with a clear Indian perspective. He particularly took great pains in raising the problem of protection and preservation of old cultural and archaeological wealth of the country. He, time and again, emphasised the need of giving full attention to preserve old monuments, temples, buildings and other works of art, which were getting ruined day by day. He made suggestions for proper amendments in the Act and for preparing a complete national list of all available monuments and works of Art of historical and archaeological importance in the country. Participating in the debate in this regard he informed the House that many of the monuments mentioned by Col. James Tod in his book “Annals and Antiquities of Rajasthan” and “Travels in Western India” are not visible now as the authorities have been indifferent towards their value and they have been destroyed. He mentioned the case of monuments of Chandravati, near Abu, how they have been carelessly destroyed in order to lay a railway line. He asked the government to take immediate and concrete steps to save such monuments of international importance as Khajuraho. Mandu,Sanchi, Vidisha, Hinglajgarh etc. Dr. Raghubir Sinh was appointed as a parliamentary adviser to the Indian delegation to participate in the 11th session of the United Nations Ganeral Assemby in November, 1956 and represented India on the 4th and 5th committees. Prominent member of the delegation were V.K. Krishna Menon, G.S. Pathak, Arthur S.Lal. He actively participated in the discussions of the delegation. On the request of the Teachers College, Columbia University Department of History, he visited the college on 4th December, 1956 and delivered a lecture there on political and social conditions of India gave satisfactory replies to the questions raised by the audience. As has been mentioned above, Maharajkumar Dr. Raghubir Sinh had emerged as a literary writer and historian in the thirties and got great prominence in the forties. After independence he got more time to devote himself much more to his literary and historical research work. His two literary work in Hindi Jeevan Dhuli and Jeevan Kan were published in 1949 and 1950 respectively. His two historical works of great value Ratlam ka Pratham Rajya and Poorva Adhunik Rajasthan were published in 1951. The first containing history of Rathor princely families of Malwa during 17th century based on new research and the second containing a brief but detailed survey of historical events and changes in Rajasthan during 1527-1949. It was a first attempt to wirte a general history of Rajasthan, not state and ruler-wise, but in a combined and period-wise system. It received high appreciation from academic circles with the hope that the attempts would be made to adopt this method in writing future histories. He translated J.N. Sarkar’s famous book “A short History of Aurangzed” into Hindi and got it published for Hindi readers. In 1949, he prepared a list of important historical manuscripts preserved in the Raghubir Library, Sitamau and got it published for the information of historical researchers throughout the country and abroad to enable them to make use of the preserved research material in the Library for their projects. Since Fifties Maharajkumar began devoting mainly to historical research work and gradually ceased writing literary essays in hindi. However, he continued enriching Hindi language by writing his historical articles and books mainly in Hindi language in his own lucid and attractive literary style. His style gave a new dimension to historical writing, which remained no more a dry and uninteresting reading but became attractive and absorbing for the readers. He contributed research articles to various historical journals of the country bringing out new facts and information and presenting new analysis and interpretation of the historical events. His every article used to become a source of discussion in academic circles and the letter always aspired to read his next writing. In 1973 his short book on “Maharana Pratap” was published and a book on “Durgadas Rathor” in 1975 both in his inimitable style. In 1979 his book on Rajasthan historiography “Rajasthan ke Pramukh Itihaskar aur Unka Krititva” was published. He rewrote the biography of Rana Pratap, analysing the Rana’s character and role in a new light. This book “Maharana Pratap : Jeevani, Mahatva aur Den” was published in 1983. In 1984 he got published in English “The Julusi Sanehas of the Mugal Emperors of India (1556-1857 A.D.)” His edited books on Shivaji and Aurangzeb in Hindi were published in 1985. His edited work on the records of Malwa concerning the Great Indian rebellion of 1857-1858 - “Malwa ke Mahan Vidroh Kalin Abhilekh” was published in 1986. As described earlier, he edited English records of Maratha History in 3 volumes with the title “poona Residency correspondence”, which were published in 1940, 1943 and 1951 respectively. Dr. J.N. Sarkar and Dr. Raghubir Sinh Jointly edited the work “Shivaji’s visit to Aurangzeb at Agra” based on Rajasthani records, which was published in 1963 Dr. Raghubir Sinh in joint co-operation with Dr. Satish Chandra and Dr. G.D. Sharma edited “Jodhpur Hukumat ri Bahi” and published the work in 1972 with the title “Marwar under Jaswant Singh (1658-1678)”. His edited work “Fort william India House correspondence (1786-88)” was published in 1973. He revised and edited Sir Jadhunath Sarkar’s book “A History of Jaipur”, which was published in 1984. He aslso edited Hindi records in the Peshwa Daftar and got the work entitled “Selections from the Peshwa daftar” published in 1979 and his another work concerning sources of Maratha history “Maratha Rajya Sambandhi Abhilekh” was published in 1982. His other edited important works include “Vachanika Rathor Ratan Singhji Ri” (p. 1960), Kavi Kalanidhi Shri Krishna Bhatta Virachit-Sambhar Yudha (p. 1969), Shah Jahan Nama Munshi Devi Prasad Krit (P. 1975), Ajit Granth (p. 1978,) Shyamaldas Krit Veer Vinod (p. 1986), ShriDhar Krit Jangnama (p. 1986), Jodhpur Rajya ki Khyat (p. 1988). Maharajkumar Dr. Raghubir Sinh’s valuable contribution to Hindi language and literature and to historical research and learning received due recognition from vatious institutions and organisations and he was duly honoured by them. As mentioned earlier, he was awarded Mangla Prasad Puraskar in 1945, by Hindi Sahitya Sammelan, Allahabad. In February 1954, he was given prize by the U.P. Government of his book “Poorva Adhunik Rajasthan”. In December, 1975, Hindi Sahitya Sammelan, Allahabad honoured him by conferring him the honorary degree, “Sahitya Vachaspati”. In 1978, U.P. Hindi Samsthan, Lucknow specialy honoured him and presented special prize of Rs. 15,000/- for his life-long services to Hindi language and literature. Dr. Raghubir Sinh presided over the Gwalior session of Madhya Pradesh Hindi Sahitya Sammelan in April, 1976. Dr. Raghubir Sinh presided over Local History Section and Mughal Hisotry section of Indian History congress at Gwalior in December, 1952 and at Waltair in December, 1953 respectively. He presided over Annual Session of Madhya Pradesh Itihas Parishad held at Jabalpur in December, 1974. He presided over the Chaupasani (Jodhpur) session of Rajasthan History Congress in March, 1979. Dr. Raghubir Sinh’s valuble honorary services and assistance were acquired by government bodies and other institutions from time to time. He worked as Chairman, Madhya Bharat Regional Records Survey Committee between 1953 and 1956 and then continued working in that capacity since 1968. He worked as a member of the Madhya Pradesh State Advisory Board for the revision of the District Gazetteers since 1958. He had been Trustee of the All India Kashiraj Trust, Fort Ramnagar, district Varanasi since 1957. He was Fellow of the Royal Asiatic Society London for life. He was life member of the following bodies - the Asiatic Society of Bengal, Calcutta, the Asiatic Society, Bombay, the Calcutta Historical Society, Calcutta, P.E.N. India, Bombay, Nagari Pracharani Sabha, Varanasi and Indian History Congress. He remained member of Madhya Pradesh Itihas Parishad, Bhopal and Rajasthan History Congress, Jaipur. The greatest achievement of Dr. Raghubir Sinh’s life was founding of the research institute - “Shri Natnagar Shodh Samsthan, Sitamau by him on 14th August 1974. Since its foundation the Samsthan has conducted and completed several valuable research projects under his supervision and a few of them have been published which are very useful for the researchers. His greater emphasis had been to provide more and more source material to the researchers by editing and publishing the original material available in the Samsthan’s Library. Maharajkumar always abhored luxurious and easygoing life. Despite being a prince, he kept away from all ostentations of the royal life. He disliked ostension and pretension. He liked to lead a simple life from his early years. As he came into contact with the great persons in political and literary field, he developed modern ideas of nationalism, patriotism and revolution and feelings of renunciation and sacrifice. During his early age itself he made up his mind to work for the awakening and upliftment of his country. Consequently he devoted his entire life towards attaining that object working in political field but mainly through literary and historical writings. When his father Raja Sir Ram Singh died in 1967 he voluntarily stepped aside in favour of his elder son Raja Krishna Sinh Rathore. By nature he was very hard-working and never wasted time in useless chores. He had a charming, unassuming and pleasing personality. Till the end he led almost a saintly life living in a simple room with very few necessities. He wore simple Khadi clothes and ate simple food. Indeed he was a saintly prince. In the academic circles of the country he was known as the Princely Historian. Maharaja KrishnaSinhji Rathore was born on November 18, 1934. He was the elder son of Maharajkumar Dr Raghubir Sinh and his mother’s name was Mohankumari. KrishnaSinhji Rathore’s primary to high school education was completed at Sitamau. He passed the High School Exam from Shriram School, Sitamau in 1949 under the Education Board, Ajmer and the Intermediate Exam from Daly College, Indore in 1951 under the MP Education Board, Bhopal. He passed his BA from st. Johns College, Agra in 1953 under the Agra University and also his MA (History) from same college in 1955. He did his LL B from Delhi University, Delhi in 1958 and Certificate of Proficiency in Law from same University in 1959. He was selected to the Indian Police Service (IPS) in 1959 itself and joined duties on October 30, 1959. He remained in Abu from October 1959 to October 1960 for training as Assistant Superintendent of Police and from November 1960 to November 1961 he trained in Rewa. After getting these trainings, he was posted at Assistant Commandant with the First Battalion of SAF at Indore. He remained on this post till June 1961. After this he was posted at Sub-division Officer Police (SDOP) of Alirajpur from June 1962 to June 1963 and as Deputy Commandant of CSWT, Indore from June 1963 to June 1964. 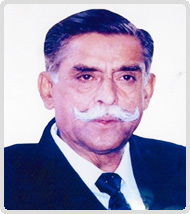 He remained in charge as Commandant of First Battalion of SAF Indore from June 1964 to January 1965. From January to June, 1965, he undertook an advanced course at National Police Academy, Abu and then was posted as Superintendent of Police in Shivpuri in July 1965. He remained on this post till April 1967. From July 1967 to October 1968, he was posted as deputy director with IB, New Delhi. He was transferred as Deputy Director (Adjutant) at National Police Academy, Abu, where he remained from October 1968 to January, 1973. From June 1973 to January 1974, he was the commandant of SAF (15th Battalion). He was then posted as Commandant of Basic Training Centre, Boster Security Force Academy, Tekanpur, where he remained till March 1977. From March 1977 to December 1977, he was posted as Deputy Inspector General with BSF, Agartala (Tripura). From there he was transferred as DIG Commandant Signal Training School, BSF Headquarters, New Delhi and remained posted from January to April 1978. From May 1978 to December 1978, he was posted as Deputy Commandant (DIG), BSF Academy, Tekanpur. From October 1979 to April 1983, he was posted as General Manager of Tear Smoke Unit at Tekanpur. In this duration, he also remained in charge as Director (Officiating) of BSF, Academy, Tekanpur from January to April 1982. From May 1983 to January, 1986, he was posted as Deputy Inspector General with Armed Police Training College (APTC), Indore. After this, from January 1986 to October 1988, he was posted as Inspector General with BSF, Jodhpur. While on this post, he was in charge of the area of Gujarat and Rajasthan states, bostering Pakistan. From here, he was transferred to APTC, Indore where he stayed form 1988 to April 1991. From April 1991 to 1992, he was Additional Director Lokayukta (SPE) and from January to May 1992, he was Additional Director General (Training) at Police Headquarters, Bhopal. On May 10, 1992, he was appointed as the Director General of Police of Madhya Pradesh and retired from the same post on November 30, 1992. Going by the ideologies that were in his blood, Maharaja Krishna Sinh Rathore dedicated himself to education and even while in Indian Police Service, he took up several courses and trainings unrelated to his work. He got IPS Training at CPTC, Abu in 1959-60 and Smoke Gas course from MPPC, Sagar in 1961. In 1962, he completed Platoon Science Course from Infantry School, Mhow and a training course in Training Science from Sainik Shikshan Kendra, Pachmarhi. In 1965 he did an advanced course from NPA, Abu and in 1967, a basic intelligence course from IB Training Centre, New Delhi. In 1978, he did a Research Methodology course from ICFS, New Delhi, in 1980 a management (public undertaking) course from IIPA, New Delhi and in 1987, a `high inter-personnel relation’ training from NPA, Hyderabad. He undertook training of Indian Institute of Public Administration from ASCI, Hyderabad. He did a training on use of technology from DCPC, New Delhi. Shri KrishnaSinhji Rathore set up a Central School on Arms in 1963. Terror of dacoits reigned in areas around Shivpuri. Shri Rathore very competently controlled the dacoity activities from 1965 to 1967 in the area. Even while serving in police department, he was constantly connected to social activities. During his stay in Abu from 1968 to 1973, he made great contributions as chief organizer of salute parade, cultural programmes, Red Cross festival, Abu festival and others. During his tenure, welfare, construction work, housing, new battalion ranging and other activities were at peak. He was the chief patron of Rajasthan Basketball Association from 1986 to 1989. He was the chairman of the Indore branch of the Youth Hostels Association of India from 1998 to 1991. He took special interest in the internationally acclaimed desert festival of Jodhpur and Jaisalmer and encouraged it by participating in it with famous tattoo show and BOP Orchestra of the Boster Security Force. In this duration he constituted the world famous `Camel Mounted Brass Band’ of BSF that found place in Guiness Book of World Recost. He organized Camel Safari on Indian-Pakistan boster in 1986 and relay race of camels in Rajasthan, Gujarat and Pakistan bosters in 1987. The Indian Dressage Team bagged fourth place in Bangkok (Thailand) with him as coach. He constituted the equestrian teams of MP Police and Boster Security Force and training them. These teams remained best in country in future. From 1973 to 1998, he was member of the executive committee of the Equestrian Federation of India and was its vice- president. He was also the chairman of the selection committee (three years term each times). He was also life member of the organization. Between 1979 and 1983, when he was posted as general manager with Tear Smoke Unit in Tekanpur, the unit became very productive and the production went up by 120 percent per year. As Inspector General of Police with BSF between January 1986 and 1988, he took charge of both Rajasthan and Gujarat states. During his tenure activities in boster areas of both states – such as operation intelligence, sports, shooting, cultural activities, welfare, various construction works, housing, new battalion ranging and others were at peak. In 1964, he undertook tours of Europe, Egypt and Beirut duling holidays. In 1972, he visited Munich Olympic, Ireland, Germany and Austria (Vienna) as observer. He visited Oman in 1975 along with equestrian and band team of BSF in the International Tattoo Show. In 1986, he undertook study tour to England, Switzerland, France and other countries. In 1990, he visited England, Italy, Switzerland and Austria as judge, coach and observer for international equestrian panel. As coach of Indian equestrian team, he visited Japan and Hong Kong in 1991 and Bangkok in 1996. As known, KrishnaSinhji Rathore was the elder son of Maharajkumar Dr Raghubir Singji. Father of Dr RaghubhirSinhji – Raja RamSinhji passed away on May 25, 1967. After death of father, eldest son ascends the throne, but Dr Raghubir Sinh was such a lover of literature and history that he refused to ascend the throne and thus KrishnaSinhji took up the ascendancy and fulfilled his familial responsibilities very well. When Majarajkumar Dr RaghubirSinhji died on February 13, 1991, the post of president of Shri Natnagar Shodh Sansthan – the historical pilgrimage of Sitamau set up by him – became vacant. Then Shri KrishnaSinhji took up this responsibility too. To fulfill his father’s desires, he contributed vastly to the progress of the research center, which posted several achievements during his tenure. In November 1991, a two-day symposium on `Political, Social, Economic and Cultural study of pre-modern Madhya Pradesh’ was organized. Also a seminar on `Cultural history of Malway’ was held on December 24, 1991. The seminar was inaugurated by the governor of MP Kunwar Mehmud Ali Khan while erstwhile home minister Kailash Chawla presided. About 150 experts from Madhya Pradesh, Maharashtra, Uttar Pradesh, Bihar, Haryana, Punjab, Delhi and other parts participated in the seminar. Between February 23 and 25, 1994, a three-day seminar on `History of Malwa’ and `Rock Art of Mandsaur (Dashpur)’ was organized. The symposium was inaugurated by eminent historian Prof Heeralal Gupta while former vice-chancellor Vikram Vishwavidyalaya, Ujjain, Prof KK Kemkar presided. About 63 persons participated in the symposium. Between May 15 and 17, 1996, a seminar on `History of medieval and post medieval Malwa, Rajasthan and Gujarat’ was held. The seminar was inaugurated by vice-chancellor of Devi Ahilya Vishwavidyalaya, Indore, A.R. Abbasi and 60 experts participated in it. Between December 13 and 15, 1998, a symposium on `Conclusive battles of medieval Rajasthan, Madhya Pradesh, Gujarat and Maharashtra’ was held. MP Dr Laxminarain Pandeya inaugurated the seminar. About 65 experts from various parts of country participated. On November 24 and 25, 2000, a three-day national seminar on `Revenue system of Madhya Pradesh, Rajasthan, Gujarat, Maharashtra and North India (from 16th to 19th century) was held. The erstwhile Public health and family welfare and public relations minister Subhash Sojatia inaugurated the seminar. About 60 experts from various regions participated. From January 10 to 12, a three-day national seminar on `History of Forts: Their battling maneuvers, practical role and their future’ was held. This seminar was inaugurated by Deputy High Commissioner of India Dr TCA Raghavan and about 85 experts participated in it. On May 11 and 12, 2006, a two-day seminar on `Attack and attackers of India’ was held and was inaugurated by MP Dr Laxminarain Pandeya. About 60 experts participated. In 2007, a daylong seminar on `1857’ was held at Shri Natnagar Shodh Sansthan, Sitamau. From February 23-26, 2008, a four-day seminar on birth centenary of Maharajkumar Dr RaghubirSinhji was held at Rajniwas Garh Laduna. Experts presented research papers on personality, achievements of Maharajkumar RaghubirSinhji and research style and history of 1857 revolution were presented. The present Chairman, Shri Puranjay Sinh Rathore was born on 1st July, 1971 in Mumbai to HH Maharajah Krishna Sinh Rathore of Sitamau and HH Maharani Yogeshwari Kumari, daughter of the late Maharana Bhagwat Sinh. Puranjay Sinh started his formal education at the Scindia School in Gwalior and then joined the historical school, Daly College in Indore. He was the fourth consecutive generation in the same school. He majored in Economics Honours from Delhi University and went on to Switzerland –where he completed hotel management at Institut Hotelier Cesar Ritz and later did a B Sc in International Hospitality and Tourism from the International College in Brig, Switzerland. His leaning towards the Hotel industry comes from the fact that he is the grandson of the late Maharana Bhagwat Sinh who was a pioneer in the early 1960’s. He was the first Indian ruler to convert his Palace into a hotel. Young Puranjay’s upbringing revolved around hotels both in India and abroad. After several part-time stints in Europe he joined American based Hyatt Hotels in 1996 in the US itself. His first assignment was at the Hyatt Regency Dallas/Fort Worth. Whilst working with this Group he travelled and worked in the Island of Saipan and also did stints in Japan, Korea and Mumbai. He then moved to The Oberoi Group of Hotels in 2003 and has held diverse and interesting portfolio’s from the I.T. city of Bangalore to the tigers of Ranthambore and now in the concrete jungle of Delhi. Like his father and forefathers his love for the out-doors and animals lies deep within him and still remains his biggest passion. He is an avid reader, a golf and cricket enthusiast to the core and is at his happiest when he spends time with his dogs. Puranjay married Princess Arunima Kumari of Kuthar in Himachal Pradesh– daughter of HH Rana Arun Sen and HH Rani Nimmi Sen. The literary streak which is so defined in this Sitamau family was always an integral part of his personal life and all through his school and college life, he won the best student awards both in India and abroad. Puranjay is very deep-rooted in the customs, traditions and the literary glory of Sitamau and together with the modern life and exposure to the professional world on a global basis, his dream is to take the Natnagar Historical Institute to International standards and recognition so that the lifetime work of his grandfather Dr. Raghuvir Sinh gets the due international acclaim. Equally important is that Sitamau will rise high on the global, historical and literary map of the world. This will benefit Sitamau not only academically, but also economically, thereby bringing back prosperity to the region like the golden days of the past.